so. something went wonky when they were sending these out to the contributors and i have ended up with two copies! which i was instructed to keep. so i thought i’d share the love. 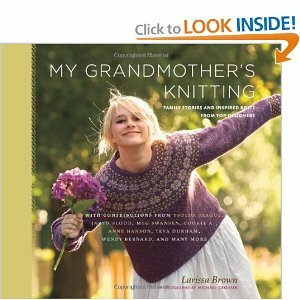 this book includes all of these lovely patterns, as well as histories of families knitting. my pattern is this one. and this book could be yours. to enter, leave a comment on which pattern is your favorite and why. or alternately, tell me about your family’s knitting history. you have until tuesday the third to get your entries in. then i’ll use the random number generator to choose a winner. I love the Fiddler Mitts. I could really use a new pair of fingerless mitts and I love the little feminine touch of the ruffle. This is on my list of books to buy! Love it. :D I am the only knitter in my family, but my paternal grandmother taught me to crochet when I was tiny and wee. I still use those lessons today, but I love the look of the knitted fabric more. I remember being very young when my grandmother tried to teach me how to knit. With little patience and experience I was quick to give up. Almost 35 years later my 4th grader came to me to ask how to “cast on” her knitting project for school. As the professed computer geek that I am I googled ” casting on for knitting” so I could teach the technique to my daughter. Here I am over two years later with a not so new hobby that I love! I mostly taught myself to knit by watching videos on the Internet, but I have also met a great group of gals that are always willing to help if needed. New friends and a not so new hobby, who wod have guessed? My favorite is Wan Jai Socks by Cookie A because I keep looking at her sock patterns but have yet to cast on a pair. They are all so beautiful! I think the first thing I would make would be the Concetta Cardigan and my mother would just love to have your Ice Skating Cape, so I think that would be my second project! I am excitedly the beginning of my families knitting history (that I am aware of)!!! My family doesn’t have a knitting history, but my grandmom always crocheted. She sadly started going blind when I was a teen, and I was really sad that I hadn’t gotten a blanket from her as an adult. (I still have my bright yellow baby blanket from her, and I swear that’s why I love that color to this day.) On my 21st birthday, she presented me with the most randomly striped, wonky crocheted blanket I’ve ever seen; half was done before she lost her eyesight, and she did the rest blind. It’s fully of holes, and it’s more of an oblong than a rectangle. It’s the most beautiful blanket I’ve ever seen, and I’m sitting under it when I type this. It is such a treasure. I love this book, but I bet the story above is why I’m drawn to the gloves due to the bright color. Even if I don’t win the book, thanks so much for reminding me how special my blanket is. And congrats on another publication! I think my fave is the Family Tree Afghan. I just love the idea of it! I love the wendys slippers pattern. My feet are always cold! Your cape is pretty cute too! i don’t have much of a family knitting history but i’ll tell you what i know – my grandma loved knitting but she made kind of hideous sweaters. she tried to teach me to knit when i was a kid but neither of us was very patient. i keep hearing bits and pieces about my great grandma’s needlework – she tatted and sewed and i think she crocheted lace as well. Conover Mittens! How great is that? My grandmother used to knit while watching basketball so she wouldn’t yell at the ref. Apparently, the madder she was, the faster she’d knit. Legend has it that she made hats for the whole team one year. I don’t know if this is actually true, but it makes a good story. However, I learned from a book, not from her, so, alas, I don’t have a true knitting heritage. I have to say I think I was about 4 or 5 when my Mom taught me how to crochet….I would make chains ! I did that for years and then FINALLY learned to knit ! In the book…..I love the family tree afghan ! but so many great patterns. I love that family tree afghan! My knitting story isn’t nearly as exciting as some…taught myself through YouTube videos. I don’t think anyone else in my family would know what to do with a knitting needle. Oh My!! I really love them all…but I truely love yours, it’s perfect for me this time of year. My grandma knitted and I still have her needles to work with and her inspriation always. Thanks for having this give away and bringing out the memories of knitting with her. Both of my grandmothers were knitters although it was my maternal grandma that sat down with me at age 8 to teach me. She is a very basic knitter and already tells me I’m far beyond her in skill. Perhaps I’m working my way towards my Great Aunt Catherine who was the most incredible cable and color work knitter I’ve ever witnessed. Both grandmothers were quilters–I made a quilt with one helping with the piecing and the other getting her quilting friends together to quilt it. And one embroidered and the other crocheted. My mother helped me with sewing. She may have helped me with knitting enough to get through 7th grade home ec, but I learned to knit (again) on my own at age 25. Very cool of you to share =) I love the sweater on the cover. I’ve never been a big fan of colorwork sweaters, but this one just makes me think I might want to knit one… someday. i have to say that i’m the only person in my family who knits. i think my grandmother use to crochet, but she passed when I was a wee tiny one. i sometimes hope that my daughter will want me to teach her someday. I love the Concetta cardigan and picture wearing it over sun dresses. So cute! I also found myself loving the slippers! Who would’ve thought?! So many pretty ones! If I have to pick, I’ll say Olina Socks. Just lovely. Love the Fiddler Mitts by Ysolda, so cute. My Grandmother taught me to knit. Everyone called her “Muddie.” She’s been sleeping for a few years now and now it’s my turn to teach the little ones (and some big ones) to knit! All patterns are awesome but I am looking for the perfect cardigan and I think the Concetta might be it. Is lovely. Thanks for sharing the book love. I like the ice skating cape. It has a simple but elegant look to it. My paternal grandmother use to knit, crochet, and do needle point when she was alive. I never met her because she died before I was born. My grandpa taught my mom how to do embroidry and crochet. I learned on my own how to knit and I’ve taught my sister and son how to as well. I love the Concetta Cardigan and the Twining Vines Pillow. I love the family tree blanket. When I was little my mother used to crochet bed spreads and sell them to help pay the rent. I remember helping her with fringe on some of them. When I went to college, I supported myself for the last year by selling handmade items on Ebay. My professors even let me knit in class!